A moth is an insect closely related to the butterfly. Both are of the order Lepidoptera. The division of lepidopterans into moths and butterflies is a popular, not a scientific distinction. While butterflies are considered to be a natural group—having descended from a single common ancestor—moths are an artificial group, defined as any lepidopteran that is not a butterfly. However, neither hold formal taxonomic rank. Popularly defined, most species of Lepidoptera are moths, and about 70 of the 80 families of the order. Butterflies can be considered to be a small group that arose from within the "moths." 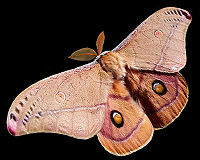 In general, moths are considered to be distinct from butterflies in that moths are chiefly nocturnal, while butterflies are diurnal; moths have comb-like or feathery antennae while butterflies have thin, slender, and filamentous antennae; and moths have a stouter and more furry-looking body, duller coloring, and proportionately smaller wings than butterflies. However, there are many exceptions to each of these characteristics. Moths are important economically, offering both positive impact, such as producing silk, or negative impact, such as agricultural pests and clothing pests. The harmony in nature can been seen in some species of moths serving as pollinators of night-blooming flowers. This allows the plants to reproduce, while the moths receive nectar in exchange. People who study moths and butterflies are called lepidopterists; the study of moths is known as mothing. This later term gave rise to the term mother for someone who takes part in this activity—sometimes written with a hyphen inserted (moth-er) or as moffer to distinguish it from the word for a female parent (in spoken English confusion does not arise as the two are pronounced differently). Moths, and more particularly their caterpillars, are a major agricultural pest in many parts of the world. The caterpillar of the Gypsy moth (Lymantria dispar) causes severe damage to forests in Northeast United States, where it is an exotic species. In temperate climates, the Codling moth causes extensive damage, especially to fruit farms. In tropical and subtropical climates, the diamondback moth (Plutella xylostella) is perhaps the most serious pest of brassicaceous crops. Several moth species in the family Tineidae are commonly regarded as pests because their larvae eat fabric such as clothes and blankets made from natural proteinaceous fibers such as wool or silk. They are less likely to eat mixed materials containing artificial fibers. Naphthalene (the chemical used in mothballs) is considered effective, but there are concerns over its effects on health. Moth larvae are not killed by freezing the items that they infest. Moths are sturdy and usually are more resistant to pesticides than mosquitoes and flies. Some moths are farmed. Most notable is the silkworm (the larva of the domesticated moth Bombyx mori), farmed for the silk with which it builds its cocoon. The silk industry produces over 130 million kilograms of raw silk, worth about US$250 million worldwide. Not all silk is produced by Bombyx mori. There are several species of Saturniidae that are also farmed for their silk, such as the Ailanthus moth (Samia cynthia), the Chinese oak silkmoth (Antheraea pernyi), the Assam silkmoth (Antheraea assamensis), and the Japanese silk moth (Antheraea yamamai). The mopane worm (the caterpillar of Gonimbrasia belina, from the family Saturniidae) is a significant food resource in southern Africa. Moths are apparently attracted to light, or more specifically, are known to circle bright objects. The reason for this behavior is not known. 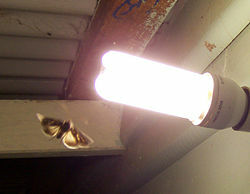 It may be moths navigate by maintaining a constant angular relationship to a bright celestial light (such as the Moon), but on encountering a bright artificial light it navigates by maintaining a constant angle to the light, resulting in the moth flying in a spiral until it hits the light source. Hsiao (1972) suggests that the reason for moths circling lights may have to do with a visual distortion called a Mach band. Night-blooming flowers usually depend on moths (or bats) for pollination, and artificial lighting can draw moths away from the flowers, affecting the plant's ability to reproduce. Light pollution is coming under increasing scrutiny as a source of many subtle ecological changes. Moths and butterflies are often confused with each other, which is understandable, given that the division is a popular distinction, not based on principles of biological classification. Sometimes the names "Rhopalocera" (butterflies) and "Heterocera" (moths) are used to formalize the popular distinction. Among common distinctions are those noted above, involving antennae, coloration, body structure, and noctural/diurnal habit. Other means of distinguishing a moth from a butterfly include pupae (most moth caterpillars spin a cocoon within which they metamorphose, while most butterflies form an exposed pupa) and the position of the wings at rest (moths usually rest with wings at sides, while butterflies frequently fold their wings above their backs). However, there are exceptions to every rule (see differences between a butterfly and a moth for more discussion). Ahmad M., R. M. Hollingworth, and J. C. Wise. 2002. “Broad-spectrum insecticide resistance in obliquebanded leafroller Choristoneura rosaceana (Lepidoptera: Tortricidae) from Michigan.” Pest Management Science 58: 834-838. Dunley, J. E., J. F. Brunner, M. D. Doerr, and E. H. Beers. 2006. “Resistance and cross-resistance in populations of the leafrollers, Choristoneura rosaceana and Pandemis pyrusana, in Washington apples.” Journal of Insect Science 6: 14. Retrieved June 15, 2007. This page was last modified on 3 April 2008, at 23:16.